The article I co-authored with my colleague Alberto Pepe, from UCLA, has been published in the December Issue of First Monday: “Political protest Italian–style: The blogosphere and mainstream media in the promotion and coverage of Beppe Grillo’s V–day” First Monday, Volume 14, Number 12 – 7 December 2009. We analyze the organization, promotion and public perception of “V–day”, a political rally that took place on 8 September 2007, to protest against corruption in the Italian Parliament. Launched by blogger Beppe Grillo, and promoted via a word–of–mouth mobilization on the Italian blogosphere, V–day brought close to one million Italians in the streets on a single day, but was mostly ignored by mainstream media. This article is divided into two parts. In the first part, we analyze the volume and content of online articles published by both bloggers and mainstream news sources from 14 June (the day V–day was announced) until 15 September 2007 (one week after it took place). We find that the success of V–day can be attributed to the coverage of bloggers and small–scale local news outlets only, suggesting a strong grassroots component in the organization of the rally. We also find a dissonant thematic relationship between content published by blogs and mainstream media: while the majority of blogs analyzed promote V–day, major mainstream media sources critique the methods of information production and dissemination employed by Grillo. Based on this finding, in the second part of the study, we explore the role of Grillo in the organization of the rally from a network analysis perspective. We study the interlinking structure of the V–day blogosphere network, to determine its structure, its levels of heterogeneity, and resilience. Our analysis contradicts the hypothesis that Grillo served as a top–down, broadcast–like source of information. Rather, we find that information about V–day was transferred across heterogeneous nodes in a moderately robust and resilient core network of blogs. We speculate that the organization of V–day represents the very first case, in Italian history, of a political demonstration developed and promoted primarily via the use of social media on the Web. Comedian/blogger Beppe Grillo has announced today on his blog that he wil be entering Italian politics by running to become a candidate of the Left wing party Partito Democratico. His decision has startled many, given his views and actions, which have often been labeled as ‘anti-politics’, causing a wide array of reactions from his supporters (as of today his blog post has gathered more than 2,300 comments) and politicians. Amongst the issues he wants to tackle on his political agenda, free information, free wi-fi, and his now famous ‘clean parliament’ campaign. has Internet use changed the number of friends you have? A forthcoming study by Hua Wang (USC Annenberg School for Communication) and Barry Wellman (University of Toronto) “Social Connectivity in America” has looked at how social networks of friendship have been changing from 2002 and 2007 and how this is related to different levels of Internet use. The study was prompted by fears that Americans have been becoming increasingly disengaged from public life and disconnected from their peers as exemplified by the work of Harvard political scientist Robert Putnam’s on social capital “Bowling Alone” (2000), who blamed television as the main culprit for the breaking up of the texture of American social and political life. [live blogging] My friend and colleague Lokman Tsui (@lokmant) is talking today at the Berkman Center about his current research: Beyond Objectivity: Global Voices and the Future of Journalism. Vittorio Zambardino writes today in La Repubblica about a recent research study carried out on the Italian blogosphere: what are Italian bloggers writing about? 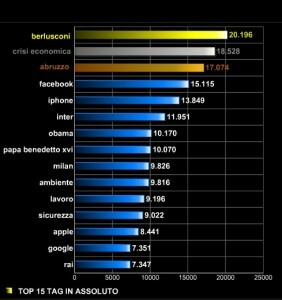 The article presents very interesting graphs, which show the top tags used in 2009 and the topics Italian bloggers write about. Perhaps unsurprisingly, the top tag in 2009 was Silvio Berlusconi, which is followed by two current affairs related tags: the economic crisis and the Abruzzo earthquake – which are followed by Facebook in fourth place. In the top 15 most used tags we also find two football teams, Inter Milan and AC Milan, president Obama and the Pope. Amongst the most discussed topics we find: 1) current affairs 2) soccer 3) the Internet 4) sport 5) politics. These are followed by a rather detailed list of less discussed topics from cinema, to art, to cooking, to music and so on. Finding current affairs at first place and politics at 5th place was indeed rather reassuring, supporting the idea that the Internet is indeed used as a virtual agora for discussion or a virtual civil society, rather than merely a tool for entertainment purposes. It should be noticed, however, that Maria de Filippi (TV presenter of Mediaset reality TV shows) was the top tag in the ‘entertainment category’, where we can find blogger Beppe Grillo at 4th place, and journalists Marco Travaglio and Michele Santoro further down in the list. Finally, finding the Internet as third most discussed topic, was also unsurprising – this is a common finding from research of different country/language blogospheres, where a big proportion of bloggers is made up by IT/media enthusiasts who blog about the medium they are using for communication (see for example our research on different language blogospheres from the Berkman’s Internet and Democracy project). While the methodology used for this study is not illustrated in this article, it certainly provides a really good snapshot of what the online community and bloggers are talking about: this is very informative of what is going on in Italian society – and should be compared to the news agenda of mainstream media, in order to establish the role of the Internet in public discourse. The Internet and the 2008 US election: participation and/or fragmentation? More than half (55%) of the voting-age population has used the Internet to get involved in the political process during the election year (74% of Internet users). The survey findings show that the Internet has become a paramount tool for people’s engagement in the political process, not only as a source of information (60% of Internet users have gone online to look for political information in 2008 compared to 22% in 1996), but as a tool for active participation. 18% of Internet users actively engaged online by posting comments on the campaign on online forums such as blogs or social networking sites and 45% watched online videos related to the campaign.